Section 7: Addressing Team Conflict > Addressing team conflict > Team conflict questionnaire debrief: What did others find? How many dysfunctional teams do you think I’m currently part of? Zero? Two? Five? Would it help if I gave you some context? This year I have been part of around twenty different teams: nine as a leader, two as a mentor, six to which I bring specialist knowledge and the rest just as a hard working member. One team had someone quit at the beginning of the year and one team I came close to quitting just two weeks ago. Work your way through the activities in this section and see which tools or strategies might be helpful for you and your team. So when you hear the word ‘conflict’ do you automatically think that something has gone wrong in a team? Well you really shouldn’t. It can be a sign of a really healthy team when members disagree and deliberate – that’s what happens when you share ideas! Conflict becomes unhealthy when it is not managed and people don’t treat each other well. An important concept in conflict management is the escalation of conflict between people in teams. This escalates conflict and if a relationship is sensitive, it only takes a small stimulus for this to happen. As conflict escalates, spokespeople start to emerge and sub-groups can start to form. People in conflict often select information that suits their position and ignore other information. Often, after peak conflict, disagreement and tension reduces. It takes a lot of energy to maintain peak conflict, and conflict may diminish because people simply become tired of continuing with it. Functional teams develop ways to resolve conflict when it escalates and also manage ongoing conflict. So help your team to use conflict productively and know when to raise the alarm if it looks like it’s getting out of control. What type of team were you working in? It was a work team, so that was the entire organisation and we were basically taken off most of our regular duties to work on this project. How did your team score on the questionnaire? So the results of our team on the questionnaire were mainly in accommodating and compromising. That didn’t surprise me, I think it was largely to do with, we had one very controlling team member who was the Manager of the team and I would say that the compromising, accommodating was mainly the rest of the team in making sure that we did what the manager wanted. In hindsight when I look back onto our team’s experience we spent a lot of time in meetings, obviously a gala event has to have some entertainment so we spent a lot of time coming back again and again to this idea of what kind of fantastic entertainment we can have, whether or not we could afford it or even secure it that entertainment. So can we have the national ballet, can we have some circus artists, can we have this and that, and I say in hindsight, it really seemed like avoidance because it made it feel like we were doing something, we were moving towards, we were working as a team discussing things, moving towards making a decision, even though all of these things were probably completely out of our budget and scope, and so it was an avoidance tactic because it stopped us talking about the real problem which was the fact that people didn’t really feel like they could make decisions or do work and really do the key parts of the job which were inviting people, finding a venue, working out the menu, the kind of more core things. What were some obstacles faced by your team? So the nature of this project was that it was a really big job you know, quite a small team, a gala dinner for four to five hundred people, there’s a lot of organisation involved in that. So at some stage the team actually began to gel better and start working because the manager realised that if we continued this way we wouldn’t have any guests and we wouldn’t have an event. Most members of the team privately felt that this sort of out of scope and that we were opening ourselves up to a lot of risk to try and get 1000 people to pay money to come to an event and if we didn’t sell enough tickets it would be very negative. So myself and another team member started, the way that we got around that was we started investigating other options. What were the costs upon team members? While we got the job done there was definitely a cost to the team. People didn’t get as much experience, because they weren’t able to do their job, so there wasn’t a lot of growth for the team, which is very important in a professional job. What was the most important lesson for you? If I had my time again I’d like to see the team and myself be more assertive, within the team. Did you know that there is a role whose purpose is to help bring a team closer together and improve performance? It’s not a Belbin team team role type. Facilitation is very important to help teams function well. A facilitator focuses entirely on the process of group interaction, not the topic or content of what the team might be discussing or doing. The key role of a facilitator is to get team members interacting with each other so that the team can achieve a goal or an outcome. They challenge team thinking, if necessary, and they foster the energy and the morale of the group. A facilitator can assist team’s overtime or with just one single interaction, such as a single meeting or a workshop. Teams can access specialists facilitators, but a team leader or even a team member can also play a facilitation role. Facilitators only manage team interaction, not the outcomes. You can see that team facilitation is a specific skill set in and of itself. 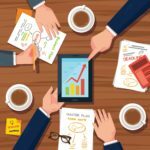 Our message is this, if your team is not quite performing as strongly as it could consider applying team facilitation techniques to your team meetings. Or if your team performance is suffering because of conflict seek out the assistance of an external team facilitator to help your team work through its issues.